A plaque hangs outside the Temple University elevator where Shari Rubin Schlesinger first saw Eric in 1972 and love later bloomed. It was move-in day, Sept. 6, 1972, and Sharyn Rubin was among dozens of female students loading her belongings into the south elevator at Temple University's Hardwick Hall when her mother noticed him, that young man operating the elevator. "There's a nice boy," Rubin's mother told her, pointing to Eric Schlesinger, then a Temple senior. Schlesinger doesn't remember that, but he remembers vividly what happened a few days later at a 50s-style college mixer, when up walked "Shari" Rubin, her hair in pigtails. "Hi, Mr. Elevator Man," she said warmly. Eric Schlesinger and his wife, Shari, around the time they were students at Temple. So began a 45-year relationship that included careers, marriage, travel, trips to the theater, and an enduring connection to their alma mater and the elevator that seeded their love. 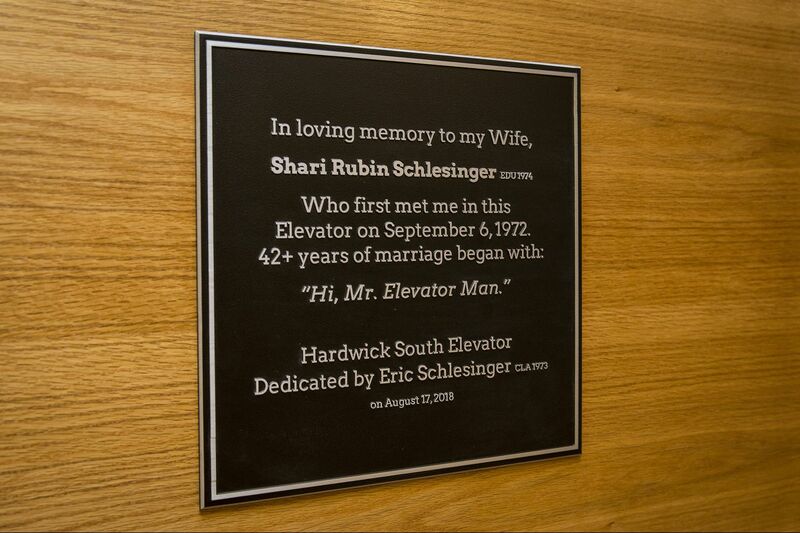 This week, Temple will name that same elevator in Hardwick (yes, it still houses Temple students all these decades later) for Shari Rubin Schlesinger, who died last year after a long battle with colon cancer and more than 42 years of marriage to Schlesinger. A plaque now hangs outside the elevator, briefly telling the couple's story, and a formal ceremony will be held Friday, the day before what would have been Shari's birthday. Her husband made a financial donation to the school in return for the naming rights. Both Schlesinger and Temple declined to release the amount. "This is something that I wanted to do," said Schlesinger, 67, a career coach at Inter-American Development Bank who lives in Silver Spring, Md., "so perhaps other students will see that things can happen in the elevator and to recognize the notion of giving back to the university. They, too, can … make a difference to the university." That's exactly what such gifts can inspire, said David Bass, senior director of research at the Council for Advancement and Support of Education, a nonprofit that deals with philanthropy. For years, colleges have sold naming rights to donors for all kinds of things — auditoriums, classrooms, buildings, walkways, benches, plazas, bricks in a wall. Even bathrooms. "It's not just a way of recognizing donors' philanthropic support," Bass said, "but also a way of making charitable support and philanthropy visible across campus." Bass recalls at least one other instance of plans to name an elevator for a donor at a nonprofit institution. It actually makes a lot of sense, he said, because people wait in front of it with time to gaze — and, in Temple's case, read the Schlesingers' sweet story. "You could say it's an uplifting gift," he said. Eric Schlesinger and his wife, Shari, before her death last year. Now, a Temple elevator where the couple met in 1972 will carry her name. At Temple, student affairs officials appreciate the gift — which will help fund housing scholarships and programs aimed at improving students' living experience — but love the story behind it more. "So many of us that work in this field go into this because we believe in the special things that happen outside the classroom," said T.J. Logan, associate vice president of student affairs. "This special experience changed the course of his life." Some auditorium seats at Temple carry donors' names, as do conference rooms and bricks on a wall outside the Liacouras Center and in the walkway that leads to the Tuttleman Learning Center. This is the first elevator, Logan said. Schlesinger settled on the idea after taking a walk through the campus with Logan, visiting Hardwick, seeing the same bench outside it where he and his wife once sat and the recreation room where they danced. Though he doesn't recall the day his wife said she first saw him, he's sure of it, because she kept a written record of special occasions, how they met, their first date, his proposal, and the first time they talked at that mixer. A few weeks after the mixer, they went to a movie, The New Centurions with George C. Scott, and then their first date — a snack at the former Chuckwagon restaurant, he said. They didn't take too many trips in that elevator together after that. Men weren't supposed to be on the floors of Hardwick, then an all-female dorm. But as resident hall assistant, Schlesinger had fire marshal duties, and recalls his wife's hallmates often asking him why he was always checking the fire extinguishers on their floor. Schlesinger, originally from Allentown, got his Temple degree in psychology in 1973, then his master's at the State University of New York, Albany, and worked in career services at several colleges and then the World Bank. His wife, born in Lancaster, got her Temple degree in education in 1974, but opted against teaching in favor of editing jobs, including a job at the World Bank. They both had returned to campus over the years. He was honored as a successful alumnus in 2006-07 and has spoken to classes, and his wife was a huge Temple men's basketball fan. The couple made annual contributions to the school and both put aside money in their wills to Temple. The donation for the elevator naming was in addition to that. Schlesinger said he didn't discuss the idea of the naming with his wife before she died, but thinks she would have been pleased. While he's grateful for the education he got at Temple, he's even more grateful for the chance meeting that happened in that elevator all those years ago and the girl who later greeted him at that mixer. "I tell people without hesitation," he said, "that's the most important thing that happened to me at Temple."